A Cross Tab Report shows the relationship between two or more survey questions. It’s often used to compare how different groups responded to your survey questions. SoGoSurvey’s Cross Tab Report is available with all our online survey packages. Employee satisfaction survey – How do employees in different departments feel about the company? Customer satisfaction survey – Is there a relationship between gender and whether customers prefer to buy online or in-store? Airline survey – How satisfied are people with the quality of food for each airline? Market research survey – Are men or women interested in my product? 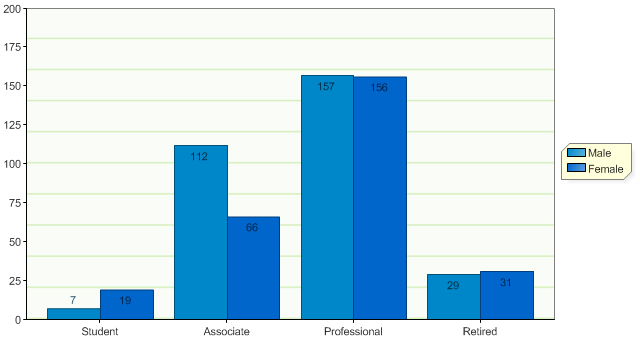 Let’s say you’re a manager at a professional association, and you’ve just conducted your annual membership survey. This year, you want to increase the number of female memberships across membership types. In your Cross Tab Report, you could compare gender with type of membership to find out the percentage of females in each membership type. Armed with this data, you know which type of membership to target first. Looking at the report below, you can see that the percentage of females who have associate memberships is pretty low and might be a good place to target. SoGoSurvey’s Cross Tab Report helps you see how various groups within your survey population answered certain questions. Armed with this data, you get a clearer picture and can make better decisions. Select Cross Tab under Pivot Tables. Select your first survey question (such as Male and Female in the example above). Select the second question (such as the type of association membership in the example above). Click Next. Select report properties. For example, if you only want to display percentages, uncheck Display Count. Click Generate Report. As you can see, the Cross Tab Report can help you uncover real trends in your survey data. What trends have you discovered from Cross Tab Reports?